Top left is NE. Image width is about 27 arc min. - Image and text © Anglo-Australian Observatory, Photograph by David Malin. 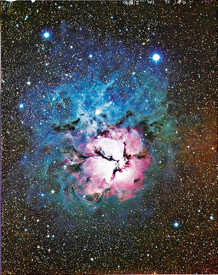 Stars, the Sun included, were born within clouds of dusty gas such as the Trifid Nebula. Measuring some forty light years across, this nebula contains enough gas to make many thousands of suns. Within it a number of young hot stars have already formed. The hottest cause the gas, mostly hydrogen, to emit its characteristic red light. Around the red emission nebula the gas contains many dust grains which preferentially reflect the blue component of starlight, and to the north (top) of the nebula can be seen a bright star which illuminates part of the dust to create a region of blue reflection. it In some parts of the nebula there are so many dust grains that they hide the glowing gas, producing the three dark lanes which give the object its name.